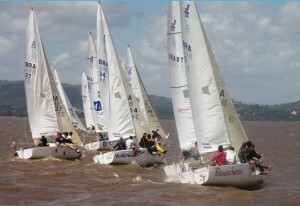 Porto Alegre, Brazil — The J/24 Class Championship began in earnest on Sunday. The lack of wind on the opening day was offset by the three races held in perfect conditions in Guaíba, with strong south wind and mean intensity of 15 knots. At the top of the fleet currently is Ruschel Ronaldo, with two wins and a fourth place. The runner-up is Henrique Dias, who crossed the finish line first in the third race of the day. Ronaldo’s team sailed without giving chances to the opponents, at least in the first two races. But the fight promises to be fierce for the title for the remainder of the championship. The Brazilian Championship has only one crew from out of state, the commander of the boat Bruschetta, Murilo Borges, the Yacht Club of Rio de Janeiro, which occupies the fourth place. The German tradition is also present in the team competition with Mannsschaft Segel, the commander Walther Bromberg, 80. He belongs to the family group’s founders Sailboats South in 1934, and constant presence in class competitions. The Brazilian Championship continues on Monday in Porto Alegre with three more races.